Baseball has been Japan's most popular sport for over a century. 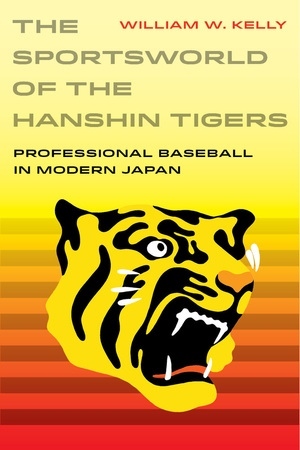 The Sportsworld of the Hanshin Tigers analyzes Japanese baseball ethnographically by focusing on a single professional team, the Hanshin Tigers. For over fifty years, the Tigers have been the one of the country’s most watched and talked-about professional baseball teams, second only to their powerful rivals, the Tokyo Yomiuri Giants. Despite a largely losing record, perennial frustration, and infighting among players, the Tigers remain overwhelming sentimental favorites in many parts of the country. This book analyzes the Hanshin Tiger phenomenon, and offers an account of why it has long been so compelling and instructive. Author William Kelly argues that the Tigers represent what he calls a sportsworld —a collective product of the actions of players, coaching staff, management, media, and millions of passionate fans. The team has come to symbolize a powerful counter-narrative to idealized notions of Japanese workplace relations. The Tigers are savored as a melodramatic representation of real corporate life, rife with rivalries and office politics familiar to every Japanese worker. And playing in a historic stadium on the edge of Osaka, they carry the hopes and frustrations of Japan’s second city against the all-powerful capital. William W. Kelly is Professor Emeritus of Anthropology and Sumitomo Professor Emeritus of Japanese Studies at Yale University. He has published widely on rural life, mainstream society, and the role of sports in modern Japanese society.